The Kidneys control the quantity and quality of fluids within the body. They also produce hormones and vitamins that direct cell activities in many organs; the hormone rennin, for example, helps control blood pressure. The Kidneys move waste products out of the Body. When the Kidneys are not working properly, waste products and fluid can build up to dangerous levels, creating a critical situation. Among the significant substances the kidneys help to control are sodium, potassium, chloride, bicarbonate (HCO3-), pH, calcium, phosphorus, and magnesium. A number of factors, including drug reactions and degenerative disease not endemic to the kidneys, may bring added stress. Analgesic . An Analgesic is any medicine that is used as pain reliever. Many Analgesics can be purchased as over-the-counter (OTC) products (aspirin, ibuprofen, acetaminophen, and naproxen. 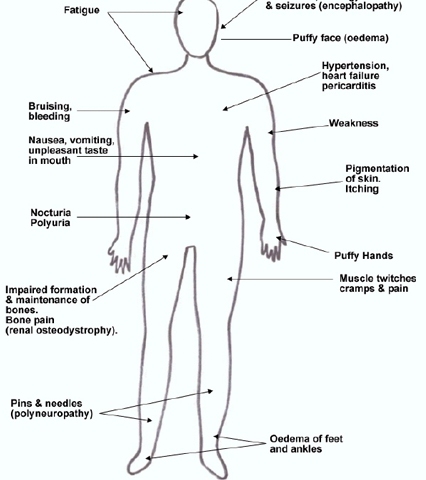 OTC analgesics taken according to the recommended dosage rarely present a problem for most people. Some conditions such as chronic kidney disease or taking OTC analgesics for a long time or in combination with other analgesics make OTC analgesics dangerous. Homocysteine. High levels of Homocysteine(a sulfur-containing amino acid normally found in small amounts in the blood of healthy persons) can result from genetic disease (homocystinuria); kidney disease; hyperthyroidism; psoriasis; systemic lupus erythemotosus; drug treatment for chronic diseases; and dietary vitamin deficiencies (folic acid, B6, B12). Homocysteine levels tend to increase with age and are higher in men than in women. High blood pressure (or hypertension). 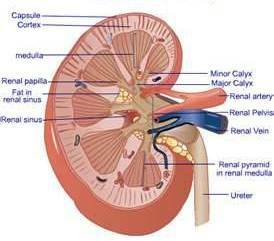 It creates a significant risk factor for kidney failure. Kidney Infection. A kidney may become infected when the flow of urine is restricted in the urinary tract. An obstruction may lead to stagnation of urine in the kidney that allows infection to spread into the bladder. Possible causes of an obstruction are a congenital defect, a kidney stone, a bladder tumor, or enlargement of the prostate gland. Urinary tract infections (UTIs). These are frequently occurring health conditions that are caused by various urinary systemic infections, sexual contact, bacteria entering the kidneys via the bloodstream or the urethra, kidney stone blockages, and kidney damage. 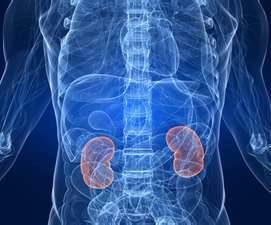 Infection can lead to impaired kidney function. Add lots of fruit and vegetables including legumes (peas or beans) and grain-based food like bread, pasta, noodles and rice to your diet. Avoid red meat, add lean meat like chicken and fish each week. Avoid salty or fatty food. Drink plenty of water instead of other drinks. Minimize consumption of fizzy drinks. Hi, after reading this remarkable article i am also glad to share my know-how here with mates.